Coloccini misses World Cup chance. | NUFC Blog. 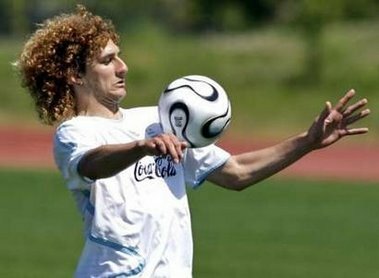 Coloccini misses World Cup chance. Coloccini: Will be resting up this summer. Diego Maradona has finally swung the axe and reduced Argetina’s preliminary World Cup squad down to size, with our very own Fabricio Coloccini missing out on the chance to board the plane to South Africa. In a way it speaks volumes for just how Colo has performed season, as getting called up along with 29 of the best of your fellow countrymen whilst playing in the second tier of English football is quite an impressive feat. You have to wonder whether Colo would indeed be on that plane had we still been playing Premier League football in the season just passed. Colo will be 32 by the time the next World Cup rolls around, so it is debatable whether the Argentine will get another shot at playing in a tournament of such magnitude again. But don’t worry too much Colo, I still want curly hair too, as I’m sure many others do. From a selfish, Newcastle orientated point of view, it could turn out to be a blessing in disguise. We now have one of our top defenders free to go off and enjoy his holidays, rest, recuperate, and hopefully come back fresh and ready to fly out of the blocks at the start of next season. Not only that, but the fact that Colo won’t be strutting his stuff in South Africa means he is now pretty much out of the shop window for any prospective buyers. All it would have took would be for him to have a good World Cup and the offers would have come flying in from potential suitors, and we know he would be off if the offer was good enough for Mike Ashley to accept. The same can’t be said for Jonas Gutierrez who, as expected, has made the final 23 man Argentina squad. I say it is expected as the Argentina coach, Diego Maradona, said a while back that Jonas is one of the first names on his team-sheet. Fortunately, Chris Hughton gave the Argentine some extra time off at the end of the season when everything was wrapped up, so hopefully that extra few weeks rest will stand him in good stead and will mean he isn’t too worn out on his return to the club. We’re going to need him next season, and we have to hope he can slip past the observations of prospective buyers for him. Although on the other hand, if he has a exceptional World Cup then we could attract a silly money, hard to refuse kind of bid from somewhere. So mixed fortunes for our Angentinian pair then, and I feel as disappointed for Colo as I feel elated for Jonas – very. It would have been nice to be represented by more than one player at the World Cup this summer, but it wasn’t to be and now it looks like we will have to settle for cheering Jonas on, unless it’s against England of course! Shame was looking forward to seeing him at international level….Least he will be fresh as a daisy come the start of the season though which is good news as well. will this guy be consider Albert Riera ? I think this puts the no signings speculation to bed eh? @4 his confidence coulda taken a battering at the world cup. who knows for sure, just take the positives. @6 agree, with every further comment from hughton it’s looking more promising. Anyone seen the new strip yet? Shouldn’t it be out around about now? Following on from Krul, Hughton’s reportedly prepared to give Leon Best a chance to prove himself over a number of games is he? As we know Krul’s proven to be a steady ‘keeper and Best’s yet to prove himself even at CCC level, I trust that Best’ll be given his chances in the course of pre-season friendlies as we can’t afford experimentation in our first season back in the Prem! cant see best getting a game! so why is he saying that.he would only get a game if all are strikers are injuried but i wouldnt be confident if that happens would u. ch says he is going to buy a striker so were does that leave him it doesnt make any sence. their is a striker who is a free agent playing in spain and wonts to come forgot his name plays for uruguay at the world cup he is about 23-24 years old must be 24 becasue we would then get him for free. Asim there is only one striker in the uruguay world cup squad who plays in Spain and that is Diego Forlan,could it be a midfielder you are thinking of? they say he plays off the front! could well be a winger who can play both.but i am not that sure rich. @10 i thought it was due for release a few weeks ago but got put back because of flight disruptions. doubt anyone will be buying the adidas strip at present and puma have missed out the ‘promotion factor’. maybe a bit of a wasted opportunity. least he will be relaxed n fresh for the start of coming season. must not have been selected or i am way off the mark. Asim, your talking about Albin i think. he wasnt selected in the uruguay squad, but he plays for getafe up front. the lads are right he plays for getafe we got more of a chance getting him becasue he wont be in the shop window so for him to come to us puts him out their then to go lessor clubs. anywho they got onto their WC squad and said that they had 4 players playing in the Premier League including wor Jonas. I enjoyed the Champ, but the Prem is what it’s all about – so looking forward to the start of the season. Think we’re still under contract with Adidas until June, there was a promo event planned but that was cancelled coz the stripes didn’t arrive or possibly adidas blocked. Enrique will get his chance next time round as this surely has to be Capdevilda’s last WC. Walter Samuel is 32 and Veron is 35. “was watching SSN this morning and they were talking about Maradonna running some journo ower”… Lousie Taylor perhaps? The RB that Joe Kinnear tried to sign and then they upped the price to £6M is now a free agent. 26 year old Albin Ebondo. Definately worth a shot. Would be good competition for RB. An area we need to improve. Hope we don’t get him,proper crock. She’s not worth the petrol. I just heard from a reliable source, Hughton has offered Best a new six year deal. aye davies is another sicknote,but what i didnt like about the article was that we couldnt afford the 5mill price tag..
Doens’t Jonas play as a left wing back for Argetina? there is one helluva difference between ‘can’t afford’ and ‘won’t afford’ so let’s not worry too much about what the press spews out. Do we really need another centre back? For me right back is priority. Aye hitman, Mike Ashley out money into it for Llambias. He should do aswell as Llambias gets next to nowt (comparatively) in the form of pay. see their fighting over young james milner’s signature..anything between 20/30 million is the expected fee, capello says this lad is the future..those of us watching him play every week new that aswell. …it’s a pitty wide-load only see £ sign & couldn’t resist cashing in. if any offers are tabled for the few decent players we have left then i wouldn’t expect anything but the same happening again. ..season after season of shite is the only thing i can see with this w@nker incharge with a special appearances made by JFK on a regular basis. komfort – plenty of people on the old blog used to slag him (JM) on a regular basis – it used to get right on my wick to be honest!! chicken , the only thing he lacks is a little bit of pace…apart from that he’s got the lot. he’s not even that slow to be honest – not blistering but he can hold his own. the thing i liked best about him was his attitude – even when he wasn’t in the best form he was always committed and gave his all. i always said he become an England regular one day, but even i have been surprised by how much he’s come on since leaving us. it saddens me to say but i’ve no doubt he’ll look back one day and see the day he left the toon as the turning point in his career. Imagine if we still had Milner and they were offering US £25M. I think we have some sell on clause like. Shows how much a young hard working, not even exceptionally talented, English player is worth now. he’s added goals to his game this season tho DJG and that’s what you pay the top dollar for. it doesn’t matter how “talented” they are – if they have a knack for sticking it in the onion bag then there will be clubs queuing up to pay good money. Look at Lamps – not particularly gifted in the “messi” sense of the word, but he scores 20+ goals a season from midfield – and that is worth an absolute fortune! Be interesting to see how long Lamps can stay superfit for now he’s past the 30 mark. James Milner, dont know what the fuss is about him, has`nt improved since he was a teenager and breaking in with Leeds. It baffles me when i hear Citeh want him for big bucks , yet are willing to let steve Ireland go. Ireland is twice the player Milner will ever be. Seems certain players prices increase with little justification. I recall where Xabi Alonso was made available by Liverpool, so as they could sign Gareth Barry, it never happened, but what were they thinking, Alonso was twice the player Barry will ever be. Just dont get It ! Don’t they show much English footy in the states then, Chuck? Seems Fergy is bound and determined to sign young Rodwell from Everton, the new Rooney. cost them sixty grand from the League of Ireland side Sligo. Perhaps we are using the wrong clubs to model ourselves on, as Moyes is doing a great job with little in the way of funding. Yes they do Chicken , in fact we have more football available for view than you do in the UK. I stand by my statement, that Xabi Alonso is twice the player Barry will ever be , the same goes for Ireland in comparison with Milner, who along with Barry are highly overrated, guess it reflects the fact that mediocre Engligh players are at a premium, compared to their non english counterparts. Must be something to do with the new ruling that teams must include eight home grown players in their squads in the near future. chuck – to be honest its been that way for quite a while now with english players being overpriced when compared to similar stature players from abroad. The thought was why buy english when you can get more for the same money when shopping abroad. Thing is, now exchange rates are cancelling that out meaning not only that english players are expensive, their european counterparts are catching up. No English players on that list. I agree that English players are over-priced – I think footballers in general are over-priced tho. BS you can watch any match in the UK if you know where to look. Chuck – I agree that Alonso was/is better than Barry. Twice as good? I’m not so sure you can quantify it like that. Saying that Milner has not improved is absolute tosh though. He was arguably THE most improved player in the Premier League last season and is already close to if not as good as Ireland. Be interesting to see how these ‘mediocre Engligh players’ get on against the USA in a months time. I reckon the yanks will give us a good game, DJG. I can see them coming second in the group to be honest. I don’t think we’ll have too much trouble beating them though. Yeah could be right but football is our national sport, some people (plebs) would say cricket. USA has four sports ahead of (soccer) as they call it. Baseball, american football (although its played with the hand) ice hockey, and basket ball. Footy is catching up but very slowly and understandably so considering that lot. Over there soccer is primarily a game for kids at the weekend, not like a religion like it is here. Rant over. The reality is most people in the states are totally unaware that there even is a world cup. Not like the, im guessing ex-pats or enhusiasts, that come on this and Eds blog, but mainly Eds blog from the States. Its a shame because like you say Toon Chicken they have a decent shot at coming 2nd and getting to the knockouts of a major tournment would surely raise interest in footy over there. I wonder if chuck or anyone could tell us what telly coverage there is of the USA games and how many people will tune in. TC – I seen that list, and I get what your saying. But the top end of the market is the top end of the market, which perhaps speaks volumes of just how over-rated some English players are, or how unadaptable they are with regards to moves to abroad. I was more referring in general, that a club will have to pay more for an English player than they would for a continental player of equal quality. I just tried to find the articles, but according to our national press. Over 100 000 tickets have been solf to visitors from the States will be here for the world cup. They also have paid the highest sums for broadcasting rights. Dont know where you get your info. from, but we have entire stations dedicated to football Fox Soccer Network is but one, Setanta, Espn, plus all the Spanish language channels, so many I really dont know them all. just how do you reach that conclusion ? Probably more people will attend from the USA than the UK. One can watch at least five EPL games here on the weekend alone, thats just on one station. As for beating us, you might just get a surprise, we are not that bad a side. The league here although not that great a quality is gaining strength, with brand new purpose built stadiums. There are many thousands of children of both sexes presently playing the game at a grass roots level and we are developing quite a cadre of young players. Who knows we may have the Kakas and Ronaldos of the future here. My husband and i ended up being now satisfied that Edward managed to finish off his or her studies using the precious recommendations that she gained out of your blog. It is now and again perplexing to just always be making a gift of solutions that many a number of people might have been selling. Therefore we understand we have got the blog owner to thank for that. The main explanations you made, the easy site menu, you see, the relationships you will make it easier to create 3 . it is everything spectacular, and it’s letting that the young lad in addition to our family reason why this matter is considered pleasurable, which is incredibly indispensable. Thank you for all!